One of the key benefits of carving your own custom stamps is that it means you can create your own unique designs. 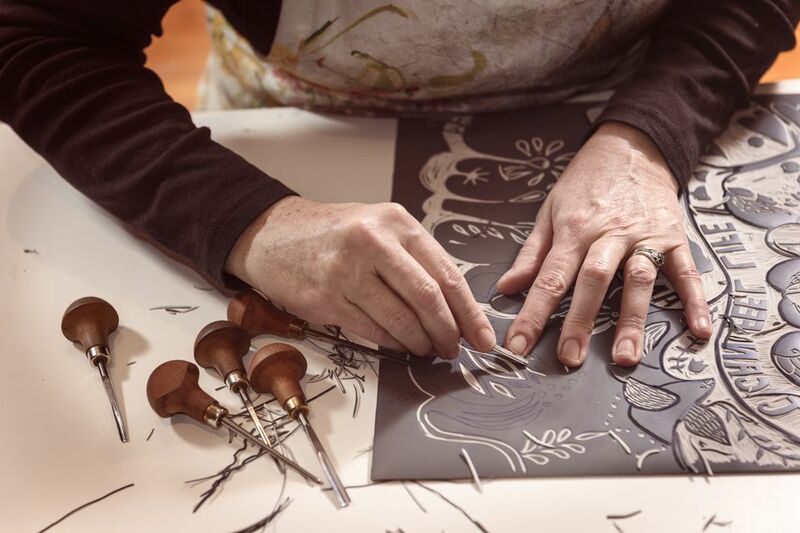 While it is possible to carve 'free form' images into an eraser or rubber block, or draw directly onto the surface, many people prefer to draw a design onto paper first. This allows your design to be tweaked until it is perfect. Once you have the design on paper, a couple of simple steps are all that is required to transfer the image onto the eraser or rubber block for carving. This is one of the most simple ways of transferring hand drawn designs onto an eraser or carving block. When you are carving your first stamps, bold and simple shapes are the easiest to work with. Inspiration can come from anywhere! Leaves and flowers, letters or numbers, basic figures or animals or doodles are all good for carving. Draw a shape that will fit comfortably onto the eraser. Make sure you use a graphite pencil. If you are not confident about your own drawing abilities, then tracing an image is a good option. Copyright free clipart is a great source of inspiration and all types of designs and shapes are available. To trace an image, place a piece of very thin paper such as tracing paper or kitchen greaseproof paper on top of the design. Use a pencil to draw around the outline of the design. If the image that you have drawn or traced is the wrong size for the eraser, then it is possible to resize the image using a photocopier. Simply set the photocopier to copy at the required percentage - either larger or smaller. You will then need to trace this design so that you have a pencil outline. Draw your image using pencil and make any adjustments. When you are happy with the finished image make sure that there is a single, thick and bold pencil line. If necessary, trace the image onto a clean sheet of paper. There are a number of ways of transferring the design onto the eraser, although they each follow the same principle of rubbing over the pencil line to leave a mark on the eraser. The option that you pick will depend on how you want the finished image to look. Remember that a rubber stamp stamps the mirror image of the design on the stamp (words, for instance, will be in mirror image on a stamp, but when stamped the words appear correctly). If you want the stamped image to be a mirror image of your original design, turn the pencil drawing over so the drawn side is facing down on scrap paper. Take a soft pencil and rub this over the back of the drawing. Then turn the paper over and place this with the drawn side up onto the eraser. Use a pencil to draw around the outline, pressing firmly. Remove the paper and an outline will be left on the eraser. If you want the stamped image to appear the same as the original (not a mirror image), then simply place the piece of paper with the drawing on it drawn side down onto the eraser. Using a pencil, draw around the outline if it can be seen, or rub over the entire piece of paper if it can't be seen. Remove the paper and an outline will be left on the page. If the outline is faint, draw over it with the pencil. When you are happy with the outline on the eraser you can carefully start to carve!